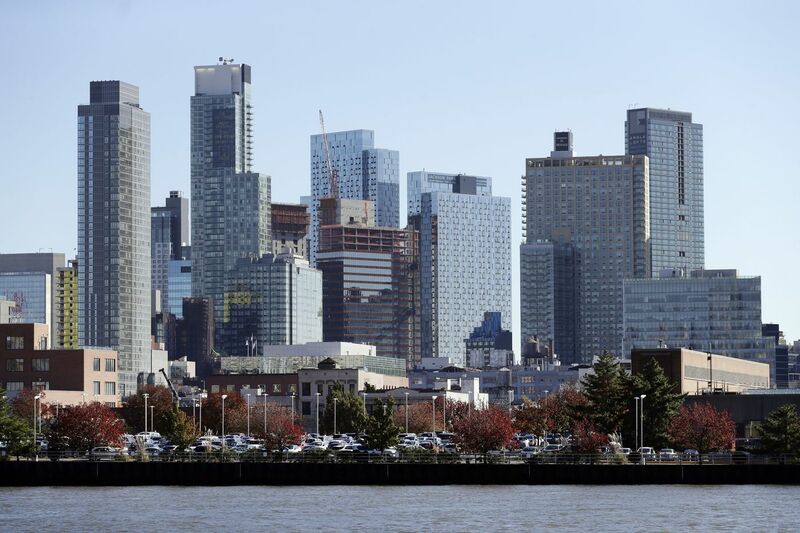 The Long Island City waterfront and skyline are shown in the Queens borough of New York, which is one of the areas that Amazon has selected for its second headquarters. Amazon has selected New York City and Northern Virginia as its new corporate hubs, opting to locate in two of the nation's deepest talent pools for tech workers over offers of aid that could have been worth more than $5.5 billion if it had chosen Philadelphia. Amazon.com Inc. said Tuesday morning that the new office complexes would be in Arlington County, Va., near Washington, and in New York's Long Island City neighborhood in Queens. The company also announced that it plans an operations center in Nashville to oversee its package delivery, transportation, and supply-chain services. Philadelphia and Pennsylvania officials marked the end of Amazon's selection process by dropping the secrecy around details of the incentives they had proposed to lure the retail and tech behemoth. Gov. Wolf's office had sought to offer Amazon up to $4.6 billion in assistance, while city officials had extended a tax break worth more than $1 billion. "You can ask Amazon how much of this was about incentives. They're the ones who made that decision, and they know what the relative weight of that was," John Grady, president of the Philadelphia Industrial Development Corp., which oversaw the city's Amazon bid, said during a Tuesday afternoon news conference. "But I don't think we weren't chosen because" of incentives. By choosing New York and the Washington area, Amazon demonstrated that its primary concern in selecting headquarters sites was proximity to young workers with up-to-date tech skills to help fuel its growth, said Katie Culp, president of KSM Location Advisors, an Indianapolis-based site-selection consultant. While Philadelphia — home to a multitude of colleges and universities — does have an increasingly educated workforce, it didn't quite have the density of talent to satisfy Amazon's anticipated needs, said Culp, whose firm has helped companies including the medical-device manufacturer Becton, Dickinson & Co. and the health-care program operator Centene Corp. with headquarters searches. The salary consultant PayScale Inc. rated New York and the Northern Virginia-Washington area in a report earlier this month as having the second and third most attractive talent pools for employers such as Amazon, with Boston taking the top spot. Philadelphia was ranked as having the 15th most attractive pool. "It speaks to the fact that the skill level and the availability of workers is of paramount importance," Culp said of Amazon's ultimate selection. "You can't double the population of your workforce aged 25 to 40 by snapping your fingers." The Seattle-based company plans to invest a total of $5 billion to develop at least four million square feet of offices each at the Arlington County and Long Island City sites, the equivalent of more than three new Comcast Center towers, creating more than 50,000 jobs across the two locations. "These two locations will allow us to attract world-class talent that will help us to continue inventing for customers for years to come," Amazon's founder and chief executive, Jeff Bezos, said in the release. "The team did a great job selecting these sites, and we look forward to becoming an even bigger part of these communities." More than $230 million would also be invested in the Nashville operations center, which will be housed in one million square feet of new office space, employing 5,000 workers. Northern Virginia, New York, Nashville, and Philadelphia were among 238 applicants across North America to bid for the headquarters in response to a request for proposals issued only six weeks before the company's deadline for submissions in October 2017. In January, Amazon announced its list of finalists, which also included Pittsburgh; Newark in neighboring New Jersey; urban powerhouses Los Angeles and Chicago; and technology centers such as Austin, Texas, and Boston. Philadelphia's proposal had centered on sites in University City and the South Philadelphia Navy Yard, touting the availability of open, developable space in those locations embedded in an otherwise dense urban center. "This was certainly not the news we were hoping for … but I can't help but be proud of the bid we submitted," Mayor Kenney said of Amazon's decision during Tuesday's news conference. "We are in a stronger position than ever to show businesses of all sizes that our city is an ideal place to live, work, and play." During Amazon's selection process, Philadelphia and Pennsylvania officials had shared only limited information about their overtures to the company, keeping an especially tight lid on anything having to do with financial incentives being offered. On Tuesday, the state Department of Community and Economic Development released letters to Amazon in October detailing an offer of up to $4.5 billion over 25 years that would have been indexed to income taxes collected from the company's employees, along with $100 million to support transportation improvements. The grant program would have been "applicable to Amazon's proposed HQ2 project, but could also apply to other businesses in other communities as well," department spokesperson Michael Gerber said in an email. "The implementation of any of these proposed incentives would require legislative approval and would have gone through a full public vetting process prior to being enacted." Philadelphia's incentive offer consisted of a tax break estimated as having been worth at least $1.1 billion to the company over 20 years, according to a copy of the city's original response to Amazon's request last year that it posted online Tuesday with fewer redactions than previously shared versions. The breaks would have been offered through an arrangement known as tax-increment financing, or TIF, through which companies get to keep some of the new tax revenue being generated in an area that they helped redevelop. In its release Tuesday, Amazon said it would receive $1.5 billion in state funding for its Long Island City plans, subject to meeting job-creation and other performance criteria, with additional funding expected from city incentive programs. For the Arlington County site, a district newly dubbed "National Landing" covering the Crystal City, Pentagon City, and Potomac Yard areas, the company was being granted $573 million in state incentives if job-creation criteria are met, along with $23 million in county support allocated from an expected increase in hotel-room tax revenue spurred by the new headquarters. Amazon also will benefit from $195 million that Virginia has committed to spending on area infrastructure improvements, while Arlington is extending an estimated $28 million in county tax breaks through a TIF arrangement. The Nashville site, meanwhile, is being granted $102 million in performance-based incentives from the city and the State of Tennessee. Philadelphia spent $160,000 — $60,000 of which had been contributed from nongovernmental sources — on its original response to Amazon, with an additional $300,000 spent on the bid since then. Philadelphia Commerce Director Harold Epps said at the news conference that that was money well spent, since the Amazon bid compelled city agencies to collaborate as never before on a proposal highlighting the city's strengths that can be applied to other business attraction efforts. Some companies have already cited the city's Amazon-bid-inspired "Philadelphia Delivers" attraction campaign as a reason for moving to Philadelphia or expanding here, Epps said. Ian Anderson, Philadelphia research director for the real estate services firm CBRE, said he has seen an increase in demand for office space in the city but said there's little indication that it is tied to the Amazon bid.